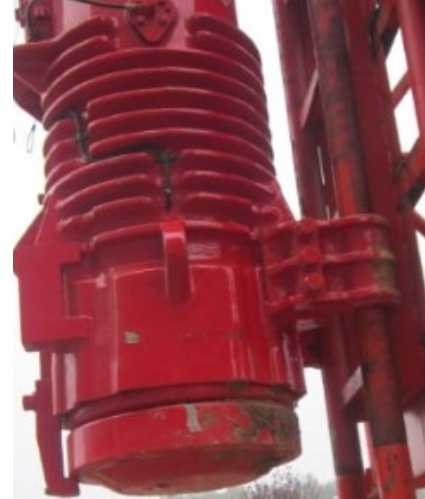 How does Diesel Hammer Work in Pile Foundation Operation? Precast piles are driven with the help of pile driver/hammer to reach expected foundation depth. Different types of hammers are used in pile foundation construction. We have already learned about all types of pile hammer, briefly, in our previous post. Here we will discuss about diesel hammer. The hammers used, now-a-days, have large engine of two-stroke facility. A cylindrical apparatus connects to top of pile. The weight that drives the pile, with ignition energy, consists of this apparatus and piston. As we go through the topics we will learn about the apparatus gradually. At first the weight is raised with auxiliary means, which may be a crane or any other means. Usually a crane holds this pile driver. While raising the weight air entered in to cylinder by suction. The weight is released quickly to drop over pile. This quick release results compression of air trapped during raising. 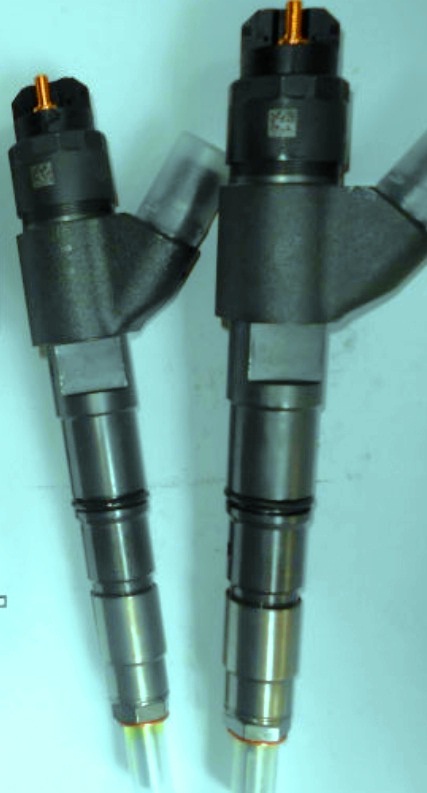 This compression raises the temperature of air to reach ignition point of fuel. Obviously the fuel is diesel. There have facility to inject diesel fuel to such heated air. The ignition of mixture (air and fuel) generates energy which is then transferred to pile head enhancing the driving energy. The ignition energy not only transferred to pile head but it drives the weight to its previous falling height. So the auxiliary means to raise the weight back its position is not required after initial application. While rising, the cylinder again draws fresh air and cycle stated above kept running. These cycles can be stopped willingly by pile operator or automatically when fuel injection is stopped due to run out of it. So far we have discussed about operating principle of diesel hammer. Now we will discuss about some details of apparatus and mechanism as well. The hammer operation starts with raising piston called ram to a designated point while the raising system automatically releases ram. The ram falls by gravity over the pile top. There have mechanism with the ram and fuel ignition system. When ram falls, this mechanism automatically gives live to fuel pump. This pump has facilities to insert fuel to such amount to result ignition successfully with optimum efficiency. While piston falls, it closes the exhaust system through which the system draws fresh air into it. This results an entrapped condition of air. In the impact block the fuel pump releases fuel into ball pan. 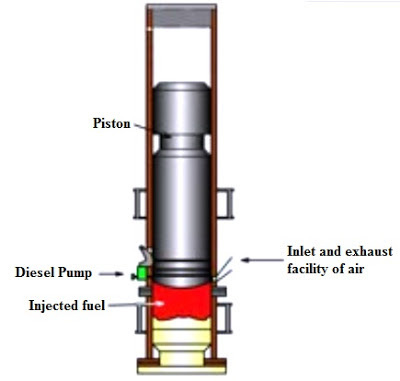 The fuel discharged into the impact block is metered such that it provides specific amount of force to pile and at a time rebound the piston to this automatically release point of raised position. As discussed above, while piston falls, it blocks exhaust system to entrap air. This entrapped air is compressed by the weight of piston. The compressed air produces a preloaded force of around 44,000 lbs. The preloaded force holds firmly the impact block against pile through driving cap. While the piston exerts force the pile becomes mobilized from it position overcoming inertia and skin friction. Now our aim is to exert extra pressure by the explosion of fuel in the diesel engine. From the previous topics of relative efficiency we have learned that the blow interval develops inertia and friction resistance which have to overcome by next blow and after overcoming the pile get mobilized. Here we have advantage of initial mobilization of pile by preload force and when fuel energy results pressure, pile moves without overcoming this resistance. Obviously in the next blow this resistance is again developed. When piston strikes impact block, atomizing fuel pump and exerts downward movement to pile due to impact. 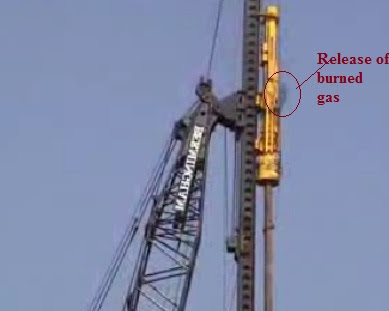 The compressed air at ignition temperature of fuel results explosion which exerts greater force than that of impact and generates further downward energy to already moving pile. The pile results rebounds on the piston and it moves towards upward. While moving up back, the exhaust system which was previously blocked in compression stroke is released. Thus the gases and explosion force is released to atmosphere. This system again draws air to its cylinder and when energy of upward movement is diminished, the piston falls again and the cycles are continued.